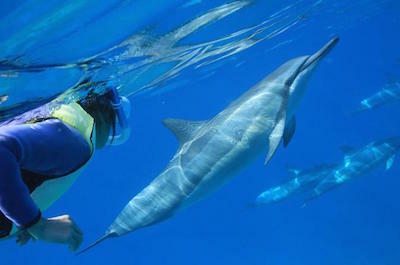 Snorkeling in Oahu is one of the most popular activities people take while visiting this popular Hawaii island. People have been pleased with the numerous opportunities to swim with dolphins and sea turtles in their natural habitat while snorkeling in Oahu. You can combine snorkeling with many other activities like a bike ride, a mountain hike or a tour of some of Oahu’s most pristine cultural sites. You can also combine a stunning helicopter flight which will take you over the beautiful sights of Oahu while stimulating your adrenaline or simply go snorkeling at the pristine Hanauma Bay Nature Preserve. Oahu snorkeling allows for a scenic cruise along Kaneohe Bay or a kayak trip to Coconut Island or Secret Island. Many of the tours are family-friendly and offer great value for you while you are visiting Oahu. If you want to be guaranteed to be able to go snorkeling in Oahu with dolphins then the Leeward Coast Dolphin and Snorkel Half-Day Cruise is a must do for you and your family. Your 5-hour adventure starts with complimentary pickup service from select hotels or you can choose to meet your professional crew and captain at Wai’anae Harbor. Here you will board a state-of-the-art catamaran and sail the coastline while you admire the unique vantage point of viewing the sights from the Pacific Ocean. You will enjoy a free continental breakfast as you sit back and relax during your cruise while you watch for incredible marine life such as dolphins and humpback whales which will be swimming in the clear waters. Once you anchor your expert crew will outfit you with snorkeling gear and you will jump into the blue waters of the Pacific Ocean. Here you will swim with a number of tropical fish and view the brightly colored coral reefs. You will probably get a chance to swim near one of the numerous Spinner dolphins that call these waters home. After a 45-minute snorkel adventure you will return to the boat and enjoy a complimentary lunch as you sail back to Wai’anae Harbor. 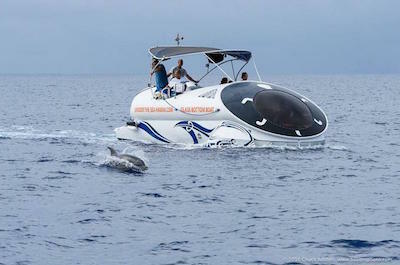 The Leeward Coast Dolphin and Snorkel Half-Day Cruise ends when you dock and you are transported to your selected hotel. If you only have a small amount of time to go snorkeling in Oahu then the Hanauma Bay Snorkeling Adventure Half-Day Tour is the perfect option for you and your family. Your 5-hour adventure has several departure times throughout the day and begins when your guide picks you up at one of the selected hotels. From here you will travel to the pristine area of Oahu known as Hanauma Bay which is now the Hanauma Bay Oahu Nature Preserve. This nature preserve is spectacular and offers a crescent shaped beach within a sunken caldera of an extinct volcano. Here you will watch a short video offered by the City and County of Honolulu’s Marine Educational Center which explains this geologic phenomenon and the marine life that lives here today. 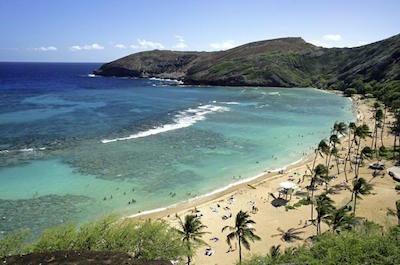 Hanauma Bay is perfect for beginning snorkelers who can view the many tropical fish in the reefs close to shore and if you are experienced you will love snorkeling at the outer reefs which are more challenging. After spending a delightful time in the water, your Hanauma Bay Snorkeling Adventure Half-Day Tour concludes with drop-off service at your selected hotel. A great way for you and the family to go snorkeling in Oahu is by taking the Kayak, Hike and Snorkel Adventure that combines many outdoor activities into a fascinating day of exploration. Your 7-hour experience begins with complimentary hotel pickup service where you will then travel to windward coast of Oahu until you reach the entrance to Hakipu’u Valley. Here you will proceed to take a short hike to a scenic overlook where you will be treated to big vistas of the tropical landscape and the Pacific Ocean. After your hike you will be transported to the picturesque Kaneohe Bay along the coast of Kualoa where you will be given a brief safety and instructional course on kayaking. You will then kayak along the coast until you reach Mokoli’i Island which is home to the ancient Molii fishpond which was constructed by hand by the native Hawaiian’s over 800 years ago. After a brief stop you will continue to kayak along Kaneohe Bay and when you reach the hidden gem of the Secret Island, you will thin you are in paradise. Here you can indulge in a picnic lunch and relax on the beach in a hammock or you can go snorkeling in the calm waters which offer excellent viewing opportunities of thousands of tropical fish. 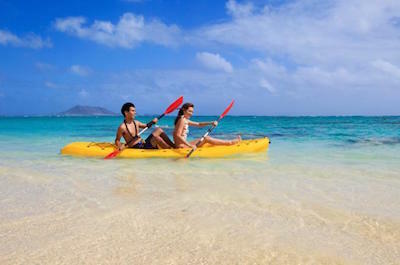 The Oahu Kayak, Hike and Snorkel Adventure finishes when you are transported back to your hotel. When you want to save some money and combine two fascinating days of adventure then you need to book the Oahu Super Saver: Helicopter Tour plus Dolphin Snorkel Adventure. Your 2-day Oahu snorkeling excursions begins with complimentary pickup service from your Ko’olina hotel or you can meet at the Ko’olina Marina. Your first day includes a thrilling helicopter flight that includes flying over iconic sites like Pearl Harbor, Diamond Head, Waikiki Beach and the surreal mountainous tropical landscape. Your 2nd day of your adventure will take you on a speed boat ride that will allow you to snorkel in the crystal clear water that surrounds Oahu. While you are snorkeling you will view brightly colored tropical fish, sea turtles and maybe catch a glimpse of a dolphin. After you are finished cruising back to Ko’olina Marina you will be treated to a complimentary lunch. 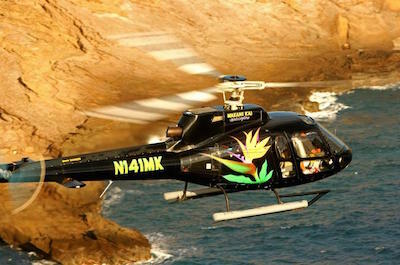 The Oahu Super Saver: Helicopter Tour plus Dolphin Snorkel Adventure concludes with drop-off service at your Ko’olina hotel. 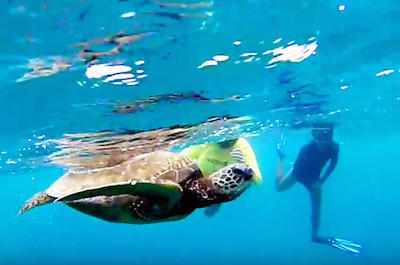 The Turtle Canyon Snorkel Cruise by Catamaran is one of a few Oahu snorkeling excursions that guarantee you to be able to swim with sea turtles. Your 2 to 3-hour adventure has two departure times during the day and begins with complimentary pickup service from your Waikiki hotel or you can choose to meet the boat at Kewalo Basin Harbor. When you arrive to the harbor you will board a 53-foot catamaran and set sail for a 15-minute cruise along the shoreline which boasts incredible views of Diamond Head and Waikiki Beach. As you sail you might see humpback whales, dolphins and sea turtles as well as other fascinating marine life. Once you reach Turtle Canyon you will put on your snorkeling gear and enter the crystal blue water of the Pacific Ocean. 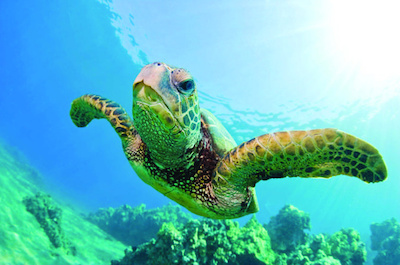 While you are snorkeling you will see fabulous marine life including sea turtles and thousands of tropical fish. On the sail back to Kewalo Basin Harbor you will be amazed at the scenery of the Ko’olau Mountains and the Waikiki skyline. If you book the afternoon Turtle Canyon Snorkel Cruise by Catamaran you can indulge in a del-style lunch on the boat. The Turtle Canyon Snorkel Cruise by Catamaran is finished when you are transported back to your Waikiki hotel. When you want to combine snorkeling in Oahu with an exciting kayaking adventure then you should take the Kaneohe Bay Kayak and Snorkel Tour to Coconut Island. Your 6-hour excursion begins with complimentary hotel pickup service where you will be transported to He’eia State Park on the windward side of Oahu. Once you reach a remote peninsula you will be fitted with gear for kayaking and snorkeling. After a brief training and safety class you will set off for the famed Coconut Island which was once a filming area for Gilligan’s Island. You will paddle out to the island while your expert guide gives your group interesting commentary on the eco-system and culture of Hawaii. Once you are at Coconut Island you will put on your snorkeling gear and dive into the blue waters where you will view tropical fish and sea turtles as well as an occasional manta or spotted eagle ray. When you are finished snorkeling you can refresh your body with free juice and snacks before making your way back to Kanehoe Bay in your kayak. After you reach the shoreline you can relax and indulge in a nice buffet-style barbeque lunch on the beach. 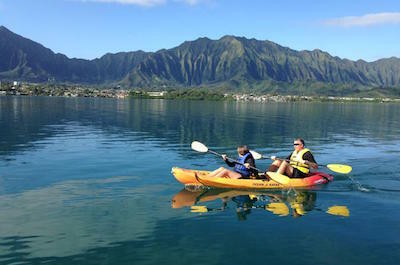 The Kaneohe Bay Kayak and Snorkel Tour ends with drop-off service at your hotel. The Oahu Combo Adventure: Bike, Sail and Snorkel is ideal for families who want to combine several exciting adventures which includes snorkeling in Oahu. Your 5.5-hour excursion begins with complimentary hotel pickup service where you will be taken by your expert guide to your first destination. You will travel through the Punchbowl Crater to the top of the Pu’u ‘Ohia mountain range where you will be outfitted with a bike and helmet. You will coast down the paved road and view spectacular sights like Diamond Head, Ewa Beach, the Ko’olau and Wai’anae Mountains, Makakilo and Waikiki. At Moana Lookout you will stop for photographs and a complimentary deli-style lunch. Once at the bottom you will be transported to Kewalo Basin for your next adventure which is a fabulous 2-hour sailing excursion aboard a catamaran. While sailing you can relax and enjoy the beautiful marine life of the Pacific Ocean as well as the incredible views of Diamond Head. You will anchor at a superb spot for you to snorkel where you can watch the brightly colored tropical fish swim in their natural habitat. 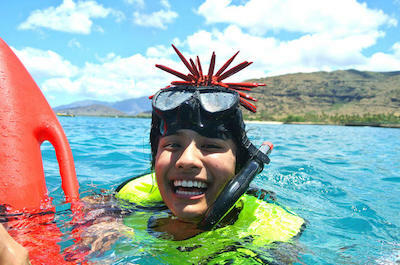 The Oahu Combo Adventure: Bike, Sail and Snorkel concludes with drop-off service at your hotel. When you want to mix several different activities into one fascinating excursion then you should go on the Oahu Bike, Hike, Sail and Snorkel Combo tour. This 8-hour adventure is ideal for families and begins with complimentary pickup service at your hotel where you will be transported to your first adventure. 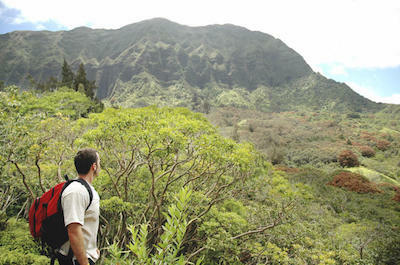 At your first spot of exploration you will take a moderate 2-mile hike through a 75-acre area of sacred Hawaiian land. As you hike for 1.5-hours you will absorb the beautiful tropical landscape which the dirt trail winds through. From here you will take an exciting sailing adventure aboard a 38-foot catamaran which will allow you to watch and snorkel with interesting marine life like dolphins as well as sea turtles in their natural habitat. While sailing you can indulge in a complimentary lunch before you set out for your next adventure. Your last bit of exploring for the day will be an easy 5-mile bike ride which takes you down a paved road through the tropical landscape of the Pu’u ‘Ohia rainforest. All the necessary equipment for this exciting combo excursion of exploration is included. The Oahu Bike, Hike, Sail and Snorkel Combo tour ends with drop-off service at your hotel. The Oahu Snorkel Cruise: Swim with Dolphins and Turtles in the Wild might just be the best opportunity for you to go snorkeling in Oahu and learn about the interesting culture of Hawaii. Your 7-hour exploration begins with select hotel pick-up service in Waikiki and Ko’olina where you will meet your qualified guide before you set sail. You will participate in singing the popular Hawaiian song by Edith Kanaole called the E’Hoi Mai Ceremony which introduces you to the wonderful Hawaiian culture. After singing you will embark on a 3.5-hour sailing expedition that will take you to far off places to snorkel with the dolphins and sea turtles. Your boat is fabulous and is equipped for numerous other watersports such as kayaks, standup paddleboards and there is a custom waterslide for you to enjoy. While snorkeling with the colorful tropical fish, your guide will instruct you on how close to get to the incredible friendly dolphins. During your Oahu snorkel Cruise: Swim with Dolphins and Turtles in the Wild tour you will indulge in a tasty hamburger which is grilled on the boat as well as quench your thirst with libations. Your excursion concludes with drop-off service at one of the selected Waikiki or Ko’olina hotels. If you don’t like crowded excursions and want to have an interesting day exploring various parts of the isolated West side of Oahu, then you need to go on the Small Group-Hidden West Oahu Land and Snorkeling Tour. Your 7.5-hour Oahu snorkeling experience is limited to ten people and begins with select hotel pickup service or by meeting your tour guide at Electric Beach. From here you will travel in a comfortable mini-van through the magnificent hillsides of the Waianae Mountain Range. You will stop at exclusive historic sites that feature Hawaii temples known as heiaus before traveling through the beautiful Makaha Valley, where Hawaiians believe was where man was first created. During your Small Group-Hidden West Oahu Land and Snorkeling Tour you will visit a cave that was carved by the ocean surf and is the home of Pele who is the Goddess of Fire in Hawaiian folklore. From here you will travel to isolate white sand beaches such Yokohama Bay where you will go snorkeling in the blue waters of the Pacific Ocean and swim with thousands of colorful fish as well as the majestic sea turtles. The Small Group-Hidden West Oahu Land and Snorkeling Tour finishes when you are dropped-off at your selected hotel or at Electric Beach. If you have always wanted to go snorkeling in Oahu then the North Shore Turtle Cove Guided Snorkeling Tour is ideal for any person, no matter what skill level. Your 2-hour snorkeling experience has two departure times during the day and starts when you meet your expert guide at the North Shore Sharks Cove Beach where you will be fitted with equipment as well as learn the basics of snorkeling. Once you are ready to hit the water you will travel to the far end of Sharks Cove where the crowds are small and the tranquility is high. You will have 90-minutes of snorkeling time in which you can explore the reefs of this protected cove as well as view the numerous tropical fish that are swimming in their natural habitat. During certain times of the year you might even get a chance to watch these brightly colored fish eat algae off the back of the giant sea turtles you will encounter. Your trained guide will be with you the whole time to boost safety and enhance your adventure. Your North Shore Turtle Cove Guided Oahu Snorkeling Tour concludes when you are back to your original meeting point at Sharks Cove. The Ocean Wildlife Adventure is a truly unique experience when you want to go snorkeling in Oahu. Your family-friendly 4-hour excursion begins when you meet your qualified marine biologists at the Ko’olina Marina where you will then be transported by a state-of-the-art eco-friendly boat. You will thoroughly be pleased with this unique hydrofoil watercraft which happens to have the largest magnified glass bottom on the island. While you cruise to your snorkeling destination on the Ocean Wildlife Adventure you will spot dolphins, sea turtles and hundreds of brightly colored fish which your qualified marine biologist will explain to you. Once in the clear waters of the Pacific Ocean you will enjoy swimming with the marine life which varies from day to day. While on board this fascinating water vessel you can indulge in free snacks and beverages as you lounge on the deck or peer down into the abyss through the magnified glass bottom. The Ocean Wildlife Oahu snorkeling adventure concludes when you return to the Ko’olina Harbor. The Sea Turtle and Tropical Fish Snorkeling Adventure is one of the best options for families that wish to go snorkeling in Oahu. Your 105-minute excursion begins when you meet your tour guides at the West Side Island Electric Beach Parking Lot where you will then travel to your snorkeling destination which will be near Waikiki Beach. Here you will be outfitted with snorkeling gear and learn about the amazing marine life that surrounds Oahu in the Pacific Ocean. Your tour guides will take you to the best coral reefs where hundreds of tropical fish live including sea turtles, dolphins and rays. You will have unprecedented views of Honolulu as you snorkel around the coral reefs. The Sea Turtle and Dolphin Snorkeling Adventure is a great way to spend an afternoon with your family and concludes when you reach the West Side Island Electric Beach parking lot. If you are staying in the Ko’olina area and snorkeling in Oahu is an excursion your family wants to experience, then you should try the Afternoon Snorkel and Surf Ocean Playground tour. Your 2-hour adventure begins with complimentary pickup service from a select number of Ko’olina hotels where you will be taken to the Waianae Harbor to meet your certified crew and captain. Once on board your power or sail driven catamaran you will travel along the West coastline of Ko Olina. 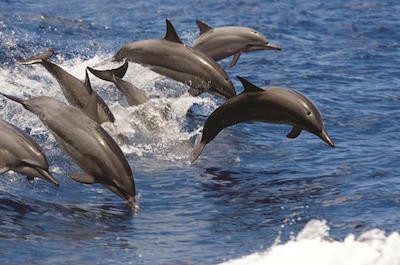 When you are traveling you will be able to watch the incredible marine life which includes dolphins, sea turtles and numerous tropical fish swim around in the Pacific Ocean. After you anchor your crew will fit you with the proper snorkeling gear so you can enjoy an exciting underwater adventure. While you snorkel on the Afternoon Snorkel and Surf Ocean Playground tour you will have opportunities to swim with the sea turtles as well as the hundreds of colorful tropical fish. You have plenty of time to relax on deck in between trips into the water and you have access to unlimited non-alcoholic drinks. If you wish to be more adventurous then book a standup paddleboard to accompany you on your Afternoon Snorkel and Surf Ocean Playground tour. Your Oahu snorkeling tour concludes when you arrive back to the Waianae Harbor and are transported to your select hotel in Ko Olina.